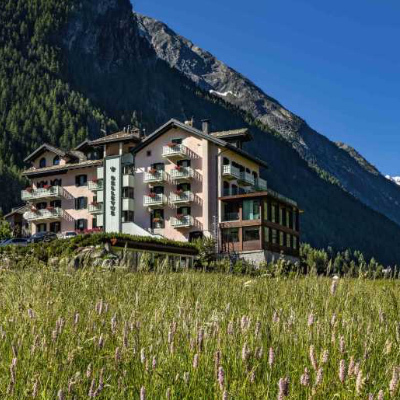 Bellevue Hotel & spa can be found in the mountainous region of Cogne, Italy. Nestled in the Alps and surrounded by the natural beauty of Gran Paradiso National Park, the area is covered with a blanket of soft, white snow as far as our eyes could see. During our stay we stayed in The Angels’ Nest suite. 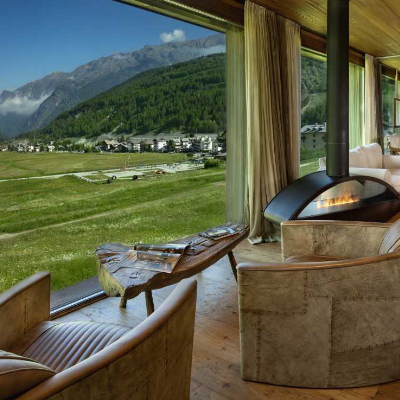 The first thing we noticed was the floor-to-ceiling windows, which allow 180-degree panoramic views across the Sant’Orso fields on the Gran Paradiso Glacier, as well as the stunning Mont Blanc glacier. The open plan lounge and living area is spacious, and the large windows give an illusion of both being an even larger space and the feeling that you’re at one with the alps. The area is complete with impressively designed pieces of furniture. There’s a dining table, sofa, numerous chairs positioned looking out over the glaciers, and the focus piece of the room would have to be the remote controlled fireplace suspended from the ceiling. Moving into the bedroom, the four-poster bed immediately caught our eye. 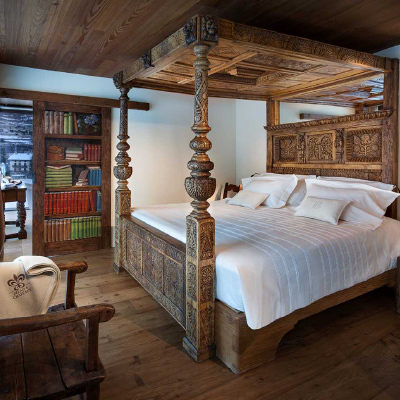 Not just because it looked inviting, but because the bed is covered with incredibly intricate patterned wood carvings. We were taken back to find out the piece had huge historic value and had been restored from a local castle. At the far end of the suite we found a bathroom with a free-standing roll-top bath, a large drench-style walk-in shower, his and hers wash basins, and of course a toilet. But the real magic was in the second free-standing bath at the other end of the suite. It’s set within a metal cage, and at the press of the button we watched as a glass door opened and the bath slowly moved outside. It’s hard to articulate in words what it’s like to have a bath outside in the beautiful Alps. But to say that seeing the steam from the bath rise in the crisp, fresh air, and to be surrounded by the stunning views and sounds this beautiful part of the world has to offer can’t be matched, goes a long way. I’ve never had a bath quite like it, I’m sure this is quite the rare experience and can’t recommend it highly enough. The suite also offers a large terrace area complete with a small table and chairs, perfect for enjoying breakfast, an early evening drink, and watching the sunset behind the snowy mountains. There is no shortage of restaurants, the main Bellevue Restaurant is their fine dining offering which certainly doesn’t disappoint. We also experienced Bar à Fromage, which is situated in a converted Alpine dairy. Here we enjoyed the sounds of the wood crackling on the large open fireplace while sampling their traditional cuisine. We must mention the cheese cellar, entering the cheese cellar is like exploring a treasure trove of the finest cheeses Italy has to offer. 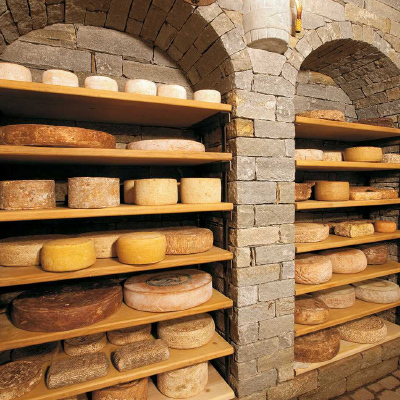 It’s a must for any cheese lover and seeing the large wooden shelves and dozens of ripening cheeses is another memorable experience you will find here. The spa facilities are a huge part of what Bellevue Hotel & spa is about. Known as the “Gran Paradiso Springs,” with 1,200 square meters of wellness and relaxation areas to explore, it’s very easy to spend a day here - and we’re sure you’ll leave feeling a million times better for it. 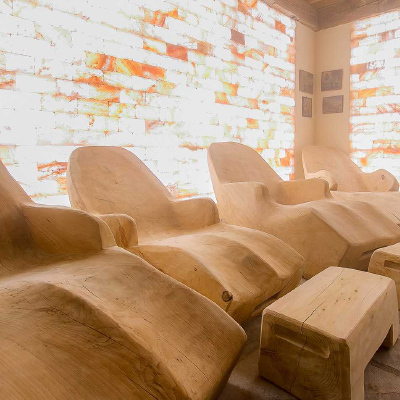 We recommend venturing into the saline cave, complete with a frosty space, water beds, memory beds, and areas where you can enjoy the therapeutic benefits of natural Himalayan pink salt. 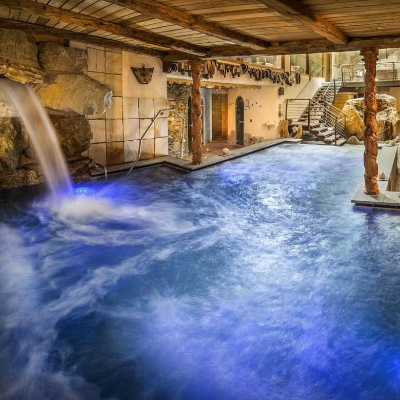 If you fancy a swim then you must experience one or both of their heated pools, then why not dip into a sauna or Turkish bath, before retiring to one of their treatment rooms for a massage or one of their many body and facial treatments. We couldn’t speak any higher of Bellevue Hotel & spa. The thought, care, and attention to detail our suite had to offer, the facilities, and restaurants, were all exceptional from start to finish. The staff are a true credit to this hotel, they really understand the art of hospitality and couldn’t have looked after us any better. Their uniforms are quite special and deserve a mention too. The entire experience will be a memorable one and we can’t wait to return in the future. We put the spotlight on the industry's most recognisable faces in our new interview segment "Seven Sins". If you want to know what inspires the industry's movers and shakers or what your favourite food loving celebrity likes to indulge in then you'll find it in their Seven Sins.